Now that we’re in the early fall in St. Paul, the bugs are trying to surely creep into your home for warmth! Whether it’s ants, wasps, bees, bats, or a variety of other pests, we know you’re not a fan of these guys invading your home. If you’re starting to see more than just the occasional creepy crawler in your home, it’s likely time to call in the St. Paul Pest Control Pest Professionals at Eco Tech. At Eco Tech we offer eco friendly pest control that takes care of the pests in your home, while not harming the environment, including your kids and pets. We offer all-natural solutions for insect control for both residential and commercial customers. At Eco Tech we not only treat your home or business to get rid of any pests, but we also show you how to prevent them from coming back in the future. We’ll sit down with you and teach you steps to prevent pests from causing problems down the road. We can also repair any damage caused by pests in your home. We always perform our repair services in a way to prevent pests from returning again. Few pest control companies in St. Paul offer anything close to our comprehensive inspection process. We use a 17 point inspection sheet to take note of where all pests or animals have entered your home. We then thoroughly inspect and fix any entry points to prevent your pest control problem from reoccurring. 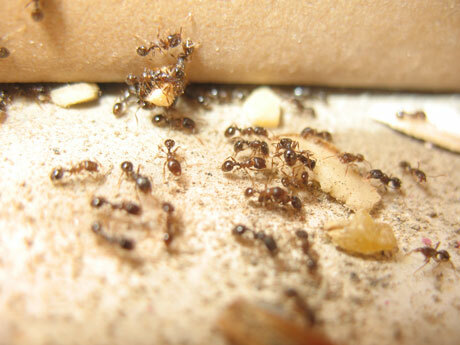 For more information about our pest control services, give us a call 24/7 at 763-785-1414. We’ll be happy to schedule a free consultation for one of our pest control experts to come out to your home to assess your needs.